Over the years we have been in various recording studios recording our samples – have a listen to these! You can also see some videos of us in action on the Watch page. We were very happy and the quartet got many many compliments from our guests! Thanks for helping make our wedding day perfect! Please thank your team for the day, everyone really enjoyed their playlist and added something extra to our wedding. Just got to say how fantastic you guys were at my daughter Sian’s wedding to Luke at Heaton House Farm Wedding Venue. I was the guy standing by you singing along and no doubt spoiling your repertoire but I just couldn’t help it I’m afraid. Great addition to a wedding day and highly recommended. I would like to thank you and your musicians for helping to make my daughter’s ‘big day’ such a success. The music was absolutely fabulous and you and your musicians are to be congratulated for the professional way they played and as I said for making the day so memorable. I would certainly have no hesitation in recommending you to anyone who is looking for a superb string quartet. Once again ‘thank you’. Thankyou SO much for performing at our wedding ceremony on Friday at St Helen’s Church Waddington!! What I heard was absolutely outstanding and lots of our guests complimented your performance before the ceremony began!! You were note perfect and created such a lovely atmosphere, helping to contribute to what I would say was the perfect dream wedding day!!! I can’t wait to get our video so I can see what I missed!! Just a quick note to say thank you to you and your colleagues for providing the beautiful string music for our wedding. The song choices for the ceremony worked so well and were played perfectly, and certainly added to what was already a very emotional room full of people! I wish I had heard more of the music but unfortunately I was outside welcoming guests for a large part, but the comments from our guests were very positive. We will certainly recommend you to friends and family. Thanks again. I just wanted to thank you for your hard work, professionalism and most importantly for the beautiful music you played at the Rolex event that we held at Liverpool Town Hall on Thursday 1st June. I would highly recommend you and hope to work with you for future events. Thank you so much for playing at our wedding last week, I loved listening and all our guests commented how good you were! I’d just like to say how much I enjoyed your musical interpretations of songs that Lisa and Julian like. It was a lovely touch to the beautiful day and I heard guests saying how much they enjoyed your music. The Didsbury String Quartet performed on our wedding day 4th February at the Belle Epoque, in knutsford. They performed a range of music (even taking requests from the kids) and everyone was commenting on how amazing they were. They made the ceremony extra special for us and provided a lovely vibe during the drinks reception. Thank you so much for being apart of out special day! 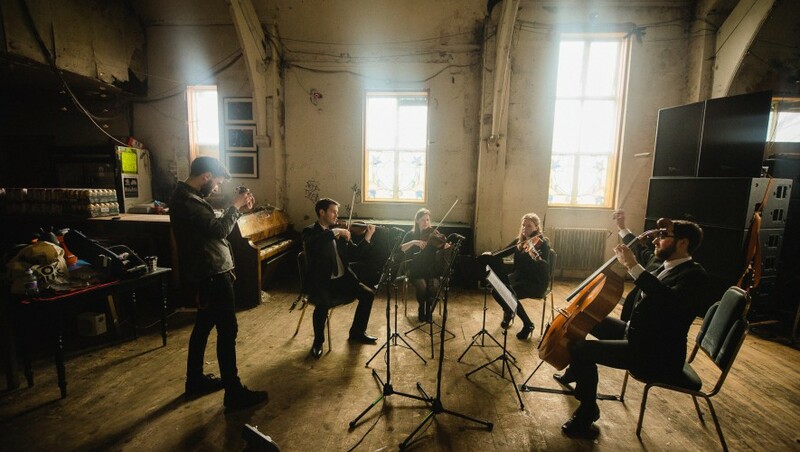 Didsbury String Quartet were fantastic at our wedding in late September – they played a wide selection of music, both classical and contemporary, and were friendly and professional. The music definitely added to the atmosphere and we would definitely recommend them! Hi David & the rest of the Didsbury string quartet. Thank you so much for playing at our wedding last weekend. Although I only got to hear a few pieces myself, the ones I heard were wonderful & many of our guests commented on how good the music you played was. We requested you play Nightswimming by REM, a piece not previously in your repertoire. The version you played was exactly what we wanted, so thank you. I would definitely recommend you to anyone looking for a string quartet for a future event. Hi guys. May I just start by saying thank you all from the bottom of our hearts for making our day truly magical. I could hear you playing whilst I was waiting to enter the room all the songs I had requested, my walk in music was everything I had hoped for and the wonderful world you played whilst I signed the register still gives me goosebumps when I think about it. The guests loved you playing up beat numbers like queen during our afternoon tea (I think you could tell by all the singing going on) and then to carry on with an encore at the end was just brilliant ! I will make sure to recommend you to anybody I know getting married or having a special occasion. We hope to cross paths with you all again one day. Thank you thank you THANK YOU! You played brilliantly and we were both so pleased. Matthew’s son Sam was absolutely in awe of your music to the point we are expecting a string instrument to be added to the ever growing Christmas list. His comment later that evening was there was nothing you couldn’t play. The quartet were absolutely brilliant! We couldn’t have asked for better music to accompany our wedding reception drinks. Our guests loved them so much! Thank you very much- lovely people, amazing musicians and we would highly recommend them to anyone. Thanks again- you helped make our day perfect. Thank you so much for playing at our wedding. All of our guests have told us how much they enjoyed listening to you through out the day. You chose a great selection of tunes to set the tone for our reception and encouraged all our guests to mingle. An enormous Thank You to the Didsbury String Quartet for playing at our wedding at Rowton Hall. You created such a lovely atmosphere and played a fantastic mix of classical, modern and songs that were personal to us. All our guests commented on how beautifully you played and said you were the perfect choice for our day. We hope to be able to see you play again soon! I’ll leave the happy couple to speak for themselves. But, as the people who paid, my wife and I thought the DSQ were terrific. The quartet greatly exceeded our expectations, and drew lots of favourable comments from guests. We were particularly grateful for the confident leadership of the hymns (which probably doesn’t feature in all your gigs!). The highest praise came from the bride’s grandfather, who is not easily impressed by anything. The first thing he said on leaving the church was that the quartet had been “fantastic” (and that was with the bride and groom’s choice of Lennon-McCartney ringing in his ears – not his kind of music at all). Praise indeed! Again, thank you so much. We loved it and it really did add a touch of something special to our day :). Without you I fear our guests could have become bored being trapped inside away from the cold. You saved it :). I have literally no hesitation recommending you to anyone. I hope you have a very successful year ahead. Thank you so much for being an important part of our Wedding Day, you entertained the guests whilst I nervously awaited the brides arrival, and you did not disappoint with Vivaldi’s Four Seasons on her entrance. It was perfect, it gave a great atmosphere to the ceremony which many of our guests commented on. It was great that you arrived promptly, and were self sufficient throughout the whole morning, it made things a lot easier for me. I would recommend you to any of our friends or family considering having strings at their wedding or event. We just wanted to get in touch as quickly as we could to say WOW. Thank you so much for the most beautiful music during our service. You really did us proud and for me personally, you did everything I could have hoped for and more. We have had so many comments about what a meaningful service it was from family and friends, and in every comment they’ve all said how beautiful and special you made it with your music. Guests were quite literally in awe of you guys. Thank you for everything – the coordination with me, the choir, playing The Cure, for playing our hymns, and for adding that special touch to make the service so memorable, special and personal for Steve and I. Simply the best. I now need to think of what else we can plan so we can have you guys there again!